UFO SIGHTINGS DAILY: UFO With Green Trail Over Homes Near Huntington Beach, California, Photos, UFO Sighting News. 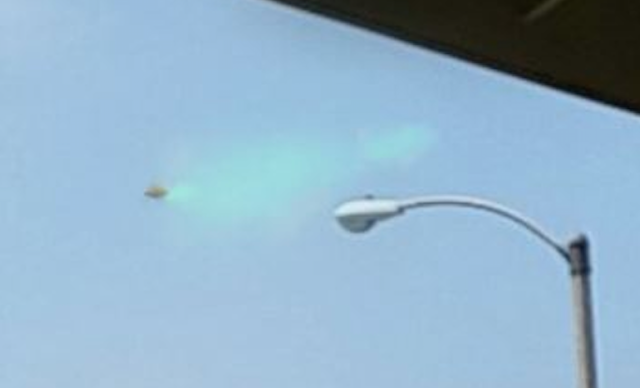 UFO With Green Trail Over Homes Near Huntington Beach, California, Photos, UFO Sighting News. Date of sighting: 7-20-2013, but reported this week. Here is an interesting report that was just sent into MUFON today. A dark UFO disk was moving around above the eyewitnesses neighbourhood and the UFO was making a green trail behind it. Now this concerns me because it appears to be a UFO that is spraying something over the neighbourhood. This may be another alien experiment...something that will effect their health, probably mental health and either improve or worsen their lives. If this UFO was damaged which caused the smoke, it would have landed somewhere. It was my birthday at my house. I was taking out the kitchen trash. It was approximately 11am, July 20th 2013. I walked out of the exterior garage mandoor on the W side of my house. I immediately heard a low rumble mixed with a hissing like noise above me to the west. I looked up to see what I first thought was a passenger plane on fire. there are many airports nearby and it was not unusual to see planes in the airspace this object was in. within a second or two, I was startled because i had realized this was no plane. it was a dull silver domed object with orange lights around its middle. I thought I could see a small spire like portrusion out of the top of the object. 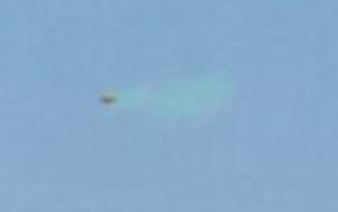 it was a typical domed ufo looking craft. In fact, that was one of my first conscious thoughts... Wow. My first real UFO sighting and it couldn't be a more typical looking UFO! It was obvious to me that this craft was in trouble. I saw no flame or intense burning/glowing but could see some sort of fluctuating vapor trail being left. The vapor trail didn't seem to be coming from any particular vent or place on the craft. The vapor seemed to almost enshroud the craft and then slip off and fall behind. The rate of the vapor coming off seemed to vary slightly. It would leave a trail and dissipate withing a few seconds. The color was both disconcerning and facinatingly beautiful. My first thoughts were that it was highly poisonous or radioactive. the rumbling hiss seemed to increase in intensity coinciding with the billowing emerald green shimmery misty vapor or smoke this craft was leaving in its wake. I felt the object was approximately a mile from me when I first observed it. It was directly above me and to the West when I first caught sight of the object, travelling in a South or SW trajectory. It's speed was that of a landing passenger plane. And it's size seeemed to be about as wide as a school bus is long. Maybe 35-40 feet wide at it's center. It was a particularly clear and sunny, beautiful morning day. I could see the object in very clear detail. I saw no markings, windows or anything on the domed surfaces both on top and below. I saw no markings on the central saturn-ring of the object. I saw what looked like a dull orange light in the short (maybe 2-3foot) spire atop the craft. It could have been the extream rush of adrenahlin but I became so overwhelmed with emotion upon seeing this object that I rememeber feeling very faint, and close to throwing up my breakfast. Fighting off the swirling thoughts (fear, excitment, shock, awe, worry, dread, mania, etc...) I remembered my cell phone camera. I remember almost ripping the pocket of my jeans trying to get my phone out. I brought the phone / camera up to my face level and shot three photos. the first was my finger in the way of the lens. the second and thrid shot are attached with this report. I believe my phone at the time was a Samsung S2... I may have had my S5 by then but I'd have to look that up. I can if it matters. the elapsed time between when i first noticed the object and when I managed to start taking photos was probably 10-15 seconds. The object travelled in a straight line heading S - SW. This would have been from my right to left. It seemed to me to be flying directly above Beach Blvd/Hwy 39, which was the major street near me. It was flying towards the ocean which was approx 3 miles away to the South.